“Oh it’s an awful day, truly dreadful.” I wonder how many times I have heard these words uttered. I heard it several times last Sunday. I heard it as folk arrived for worship. I heard it as I chatted with people at the gym and heard it from several friends that evening. Now granted these friends are members of a walking group and it had been pretty wild last Sunday. It certainly didn’t feel like the beginning of spring. We British are obsessed with the weather. How many times have you talked about it already today? When was the last time you did so? Please don’t get me wrong I’m not suggesting that there is anything wrong in this. I actually think it is lovely way for people to connect. The problem isn’t so much that we talk about the weather. No the problem I see is something else. It’s the way that we divide our conversation into “good” and “bad”. 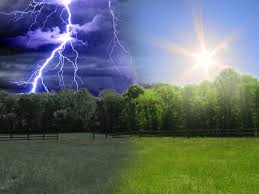 We talk about “good” and “bad” weather. It seems to me that we do this with all aspects of life. We divide life into “good” and “bad” and we do it with people too. How often do we hear the phrase “There are two types of people in this world?” Well there aren’t there are people and people. We are all made of the same stuff, we have the same spirit within us. Dividing up people into different camps helps no one and in my view it is this that leads to the evil that we do to one another, it is this that justifies so many of the wrongs we have commit against one another. When we look into one another’s eyes do we really see someone other than ourselves? Do we really see a different type of person? Yet we all do it. I do it, I’m no different to anyone else. We all have our scapegoats those we blame for our troubles or life’s troubles. It is not just with people and weather that we do this either, we do it with good fortune and with fate. We talk about good luck and we talk about bad luck. There's an excellent Taoist tale of a farmer who has a balanced view of life. This view often confuses those around him that expect him to react or behave according to the "norm". "Maybe, maybe not. Let's wait and see." "Maybe, maybe not. Let's wait and see"
Later that year, the farmer's country went to war, and the army came by to conscript every able bodied man for duty. 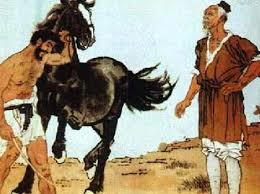 The farmer was too old to be taken, and his son could not walk, therefore he was excused. The army simply took the farmer's horses, leaving him just his original horse to allow him to keep farming. Was the farmer's life good? Maybe. Was the farmer's life bad? Maybe not. 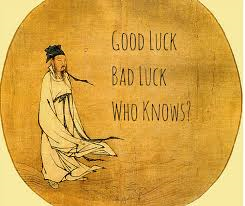 Good luck and bad luck are two sides of the same coin...it really depends on the perspective that we choose to view in any given situation. “Good” and “bad” are aspects of all life and each and every person. Sometimes what we see as “good” and “bad” turn out to be the very opposite. It’s the same with people. There are not two types of people that we divide into “good” and “bad” camps. There is simply one type of person. Division and divisiveness are very dangerous things indeed. Where on earth do we draw the line? It matters how we speak about life, it matters how speak about one another and it matters how we speak about ourselves. By saying this is “good” and this is “bad” and standing in this judgement we are creating a wall between aspects of ourselves and aspects of each other. This creates division both within ourselves and each other. What we need is reconciliation. We and all life is formed from the same source, we cannot separate any aspect of it from another. We need to learn to create the environment when the lion and lamb can lie down together. Both the lion and the lamb within ourselves, but also the lion and the lamb in each other and all life. Our world really needs this now. We seem to live in ever more dividing and divisive times. Our world needs healing and I believe it is the task of free religious communities to take the lead in this. It is up to us and it begins with us, in our own hearts and in our own communities. For it we get this right we can begin to bring healing and reconciliation to our wider world. It begins with how we engage with one another and with life. 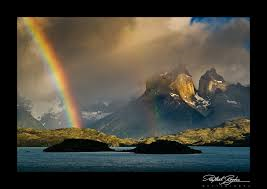 It begins with how we view life, maybe it begins with how we even view the weather. 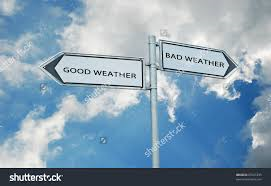 Maybe it begins by stopping seeing the weather as “good” or “bad”, and simply see it as weather. The spiritual life is not a passive life. How we live in the world really matters. How we see life, how we see ourselves and how we see one another really matters. How we speak about life, how we speak about ourselves and how we speak about one another really matters. We impact on life constantly we are not just blown and battered by life. We can set our sails and even gain mastery of the elements if we take care our sails. We are not powerless in life and our lives are not meaningless. It is important that what we actually do is recognise our power and responsibility. To truly pay attention to how we impact on life and one another. To live spiritually is to take responsibility and to fully live our lives. We are not all powerful of course not, but we are an important part of the whole and our world needs us to recognise this and to play our part fully in life. 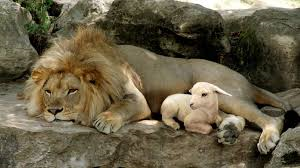 If we do we can begin to create the environment where the lion does indeed begin to lay down with the lamb. It is up to us. For this we are all responsible. Love and Fear: What do you feel?